Welcome to the Best Resource for Vegetable and Fruit Carving Lessons, Tools and Ideas – Get Free Video Now! Click to Get Your Free Lesson Now! With our detailed, step by step instructional videos, YOU CAN create beautiful fruit and vegetable carving centerpieces and garnishes with ease. You will be thrilled to learn how fast and easily you can create amazing works of food art and “WOW” your guests. 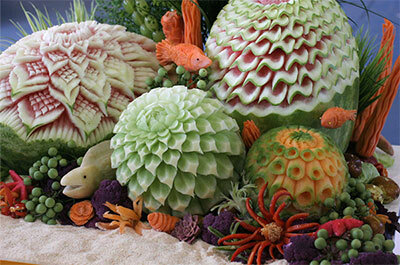 If So, You’ve Just Found the Most Comprehensive Vegetable and Fruit Carving Website On the Internet! “Never believed a DVD could be so powerful. I felt like you were in front of me in my own kitchen. “I received a silver medal and recorded the 5th highest score overall out of 90 competitors. I can’t tell you how much you’re work and dvds have inspired me. Thank you for leading the way in carving and teaching me (virtually of course) so much. Learn Secrets that professional carving experts have used for years. Whether you like to entertain family and friends, or if you are a culinary professional – chef, caterer, or aspiring professional fruit carver, you’ll find this website super useful. We’ve got quality fruit and vegetable carving tools and knives, and step-by-step video lessons, as well as watermelon and pumpkin carving patterns and transfer papers. Get a free lesson above and let your fruit carving adventures begin. Looking for Products that Make Carving Easier? Click any of the links or buttons below. Looking for Fruit Carving Ideas? 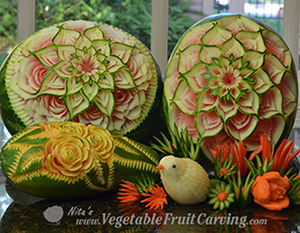 Nita Gill is inviting you into the world of fruit and vegetable carving. You’ll join thousands of others who’ve become watermelon carving and fruit carving experts using Nita’s simple and easy-to-follow fruit carving instructions! Her how to garnish & melon carving video lessons will show you how to sculpt beautiful fruit bouquets, arrangements and more! With Nita’s video lessons and tools, you’ll be amazed at the food art that you will create. Nita and her work has been featured on TV shows, newspapers, and magazines including People, and even had the honor to carve Halloween pumpkins at the White House. I had loved all yours lessons! THANK YOU VERY MUCH! It is always WOW, INCREDIBLE BEAUTIFUL, (Say my family and friends). Hi Nita, What makes me very happy is firstly, seeing what I’ve created, then come the comments from people when they see my creations. I have so much to thank you for, that words alone cannot describe it. Sometimes I don’t believe that I just carved this. Again I say many thanks to you and God bless. “Nita, I want to say that I am having the time of my life since discovering your website. I am a Head Catering Captain and am now doing alot of carving on location……. .I just have one more comment, Carving Really Does Make You Happy! Thank You So Much! your carving lesson very easy to follow and learn quickly. Thank you for making carving easy learning. Almost there. Please fill in form and click the button to get your free lessons.